This chart is meant as a general guideline for each vintage of red wine that Brys Estate has produced. It is our intention to update this chart on an annual basis as we observe the aging of these wines. In the end, the exact number of years a wine will age depends on many factors including the specific vintage of the wine, your cellar conditions, and often overlooked, the differences in the wine characteristics each of you favor in your aged wines. The safest way to follow a wine is to have several bottles that you can open over a period of years thus seeing when a particular wine is reaching its peak. If you have only a single bottle you might want to err on the side of the earlier years of these predictions. We strive to have all Brys Estate wines taste good at release and also have the ability to improve with age. Our philosophy on how to achieve both of these goals is summarized in the word - balance. A balanced wine is one in which tannin, acid and fruit are present in harmony while oak and alcohol are kept from dominating. Soil, philosophy, and growing season, amongst extended barrel aging and attention to detail all through the winemaking process, contribute to a great wine when released. The final responsibility for enjoying a superb bottle of wine is yours: cellar aging to perfection. Enjoy! 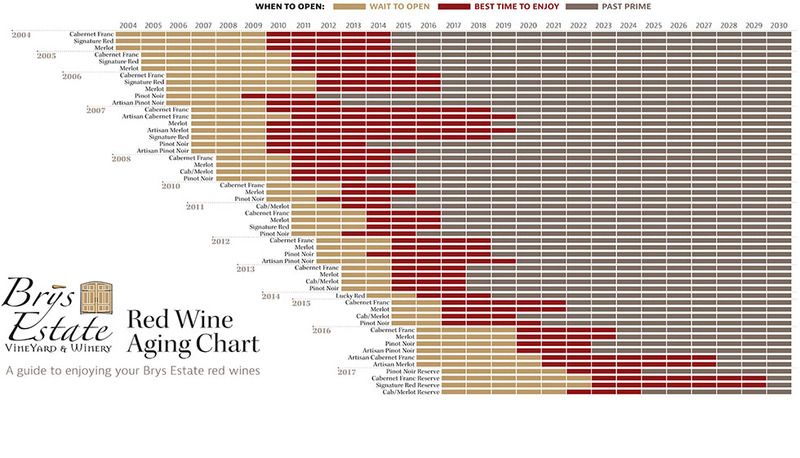 Download the Red Wine Aging Chart here.